Now, I have to do it just a bit different, because I'm using EZ track... I need to spread some Elmer's on the roadbed, so when I spread the ballast, it sticks to the side (otherwise, because it's plastic, I will use way more ballast, as it will fall down the sides of the plastic roadbed) so I'm wondering if I still need to spray it with the wet water, or, would it be better to mix a bit of alcohol with the 50/50 white glue? And if I do add alcohol to the 50/50, how much should I use? I know this is probably old information, and I keep seeing a lot of conflicting videos on ballasting on Youtube, so I figured maybe someone here with ballasting experience will have some better answers. The slope of the ez track roadbed is too steep to be realistic. Let your ballast take its natural slope, spray it with your wetting agent (I prefer isopropyl alcohol, it dries faster), and apply your white glue. I decided to build up around the roadbed with water putty. That helps with the slope. Be sure you paint the rails and ties before you ballast. I never got around to doing any ballasting on EZ Track. I used a wash of diluted back India ink on the track pieces. It toned down the gray plastic and made them look dirtier without going through the whole ballasting process. That's an idea! But... I already bought the ballast. I also considered that "make it stone" spray paint as well. But the India Ink idea... I might not have enough ballast for everything, and there are areas of the layout that will be hard to ballast, that an India ink wash may do the job! Paint the track. Real creosoted wood ties are not black for very long and real rails are not shiny silver on the sides. That saves me a bit of time there, for the rails... but it's representing a studio that laid the track recently for a movie production, so the ties would be mostly new, and a rich black. Oh, and yes, one CAN make a layout with EZ track... in fact, it has been SO EASY to do! Oh, and in answer to the question "how do you solder EZ track?" well... you don't... but if you did, you would do it the same as you would any snap track with plastic ties... hot solder iron, and solder quickly, so you don't melt plastic... but honestly, because of how the roadbed snaps together, and how the track connects, soldering is a complete waste of time for EZ track. It isn't needed at all! That's the whole point of using it! Most of my layout is ballasted and weed grown ez track. I'd post pictures if photo bucket was still there. If you are doing an old west layout, they almost never used ballast as we know it today. It was all about getting the road built fast, so it was just dirt or sand. Plus, the rail in those days was lucky to be 30 or 40 pound rail. Code 100 as on ez track is around 150 pound rail. I live with that size because I've painted, ballasted, and weeded my track into near invisibility. Posting pictures is still just as easy... here's what you do. Post your image on one of those accounts... your "wall" or your "gallery" or whatever they call it. Now, go to the image you posted, just like you did with photobucket. Now that you have right clicked on the image, you'll get a window that opens... click on "copy image location". Now, do exactly what you used to do with Photobucket... click insert image, and just paste that image location in-between the two prompts, and you have your photo up! That's when i remembered all of the movie sets that had been built in the past to depict that fictional "Wild West". Sets that were my inspiration to model the Old West to begin with! That's when I decided that I'm no longer modeling the Old west, but rather, a movie studio out in the middle of nowhere. Operations can still happen, but, rather than operations based on industry, it's operations based on bringing supplies into the set... getting actors to and from the studio... Maintenance of Way to keep the "property" movie ready at all times, and, for more action... moving and building trains for the "director's" next scene. A lot can be done when the director needs to film a scene with a Connie, pulling passenger cars into the west side of the station to catch the light just right before the noon day sun, but the Connie is over at the shop, the MofW train is on the west side of the station set the director wants to use, while the passenger cars are hooked up to a 4-4-0 on the east side of the station, on a different spur, and there is a 4-6-0 with a cattle car bringing cows in for tomorrows scene blocking the right or way between the shop, the Connie, and the America. that will need to be moved. It's yours to do as you please. That's the cool thing about model railroading. Of course, you can't have a movie set without old #3. Lay some track to Railtown. Tyco made a die cast Sierra No. 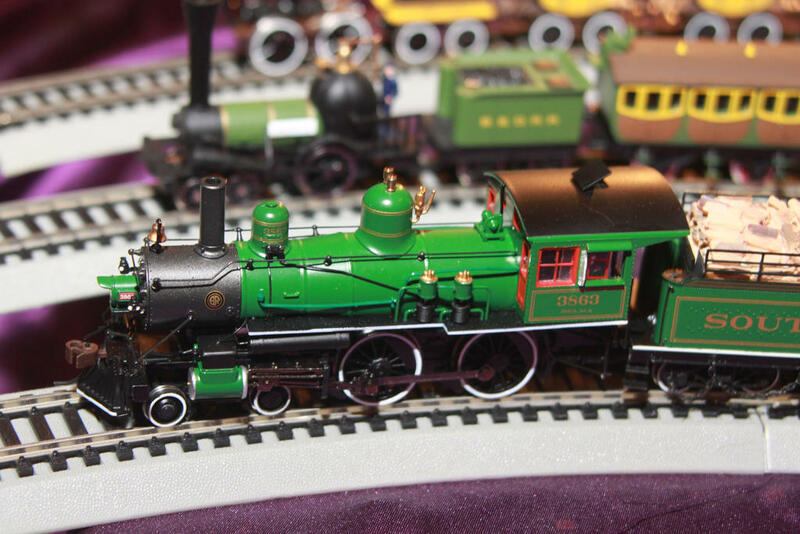 3 many years ago, they are still around at train shows. DC engine, difficult to convert to DCC.